An all indigenous team of AFL Football Players , are playing games in Ireland , titled the International Rules Series . It uses a round ball , and different rules to AFL . 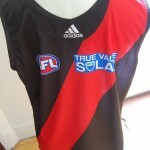 Proud team members are wearing Dreamtime themed , football jumpers , jerseys , guernseys . The Aussie team lost the first match by 22-points to Ireland , at Breffni Park in Cavan . Post match , their coach admitted they struggled with using a round ball , and found the positioning of the game confusing . He was not satisfied with their chase , run and tackling skills and believed they failed to apply pressure to the opposition . Buddy Franklin , new Sydney recruit , was one of the best on ground for the Aussies , but has now left to attend a wedding back home . The Australians will find it difficult to win the International Rules Series and the Cormac McAnnellen Perpetual Trophy. "It's going to be tough, absolutely, really, really tough. But stranger things have happened," he said. Reports of late night partying by the team after the loss , have also been downplayed by the coach . 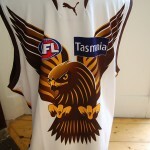 He believes they have settled now , are focused , and as a proud group of elite , AFL footballers , will attempt to win the Series and take pride in wearing their indigenous football jumpers , jerseys , guernseys . 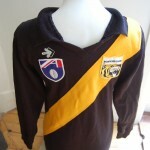 This entry was posted on Tuesday, October 22nd, 2013 at 1:52 pm	and is filed under AFL, football jumpers. You can follow any responses to this entry through the RSS 2.0 feed. Both comments and pings are currently closed.